Second Favorite Gran Alegria showed a performance of another class in this year’s Oka Sho (Japanese 1000 Guineas), the first leg of the fillies Triple Crown, to exceed Almond Eye’s accomplishment just a year ago and renew the race record by 0.4 seconds. 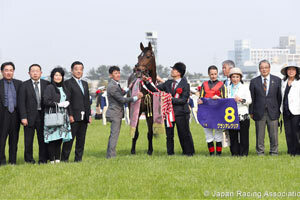 Winning her two-year-old debut in June last year while beating Danon Fantasy by two lengths, the Deep Impact filly promptly scored her first grade-race title in her next start in the Saudi Arabia Royal Cup (G3, 1,600m) in October and finished third against boys in the Asahi Hai Futurity Stakes (G1, 1,600m) in December and hadn’t raced since until the Oka Sho which was her first start of her three-year-old campaign. Trainer Kazuo Fujisawa won his second Oka Sho title—his first being with Dance in the Mood in 2004—and 27th JRA-G1 overall while Christophe Lemaire also won his second Oka Sho title after Almond Eye last year and is now with 23 JRA-G1 titles. K. Fujisawa Sunday Racing Co., Ltd.
T. Saito Sunday Racing Co., Ltd.
M. Nakauchida Danox Co., Ltd.
Y. Tomomichi Kaneko Makoto Holdings Co., Ltd.
K. Fujisawa Shadai Race Horse Co., Ltd.
K. Yoshimura Shadai Race Horse Co., Ltd.
Y. Tamura Sunday Racing Co., Ltd. The Oka Sho, which is the first of the five JRA Classics held during the year, determines the champion three-year-old filly possessing the fastest speed running over 1,600 meters and serves as an opportunity to scout potential broodmare talents. The Japanese equivalent to the One Thousand Guineas originated in England, the Oka Sho was first held at Nakayama Racecourse in Chiba, run over 1,800 meters and under the name “Nakayama Yonsai Himba Tokubetsu”, then changed its distance and venue under the new name, “Oka Sho” (Oka, meaning cherry flower which is in full bloom at this time of the season). With the entire graded races opening its doors to foreign-trained horses in 2010, the three-year-old Classics including this race entered a new phase with international G1 status. While speed is a much required ability to win this race, the extension of the homestretch as well as a deeper turf surface and an uphill stretch at Hanshin after the track renovation in 1991 has added “stamina” as an added qualification—a newly added outside turf track further extended the homestretch in 2006. The Oka Sho, together with the Yushun Himba (Japanese Oaks, G1, 2,400m) and the Shuka Sho (G1, 2,000m), is also widely considered as the fillies’ version of the “Triple Crown”, a title which has been claimed by five fillies in the past including Gentildonna (JPN, by Deep Impact) and Almond Eye (JPN, by Lord Kanaloa) both of who completed the sweep and went on to capture the Japan Cup (G1, 2,400m) and Horse of the Year title in 2012 and 2018, respectively. 2018 Hanshin Juvenile Fillies (G1, 1,600m) victor and Best two-Year-Old Filly Danon Fantasy marked her third consecutive graded title in the Tulip Sho (G2, 1,600m; Mar.2), one of the trial races towards the Oka Sho. Shigeru Pink Dia and Noble Score earned their tickets to run in the Oka Sho finishing second and third, respectively, in the Tulip Sho while 2018 Artemis Stakes (G3, 1,600m) winner Schon Glanz finished fifth. Oka Sho entries from other trial races were: No One, Pourville and Juranville, the top three finishers of the Fillies’ Revue (G2, 1,400m; Mar.10); Regard Calme and Red Aster, the top two finishers of the Anemone Stakes (1,600m; Mar.10). 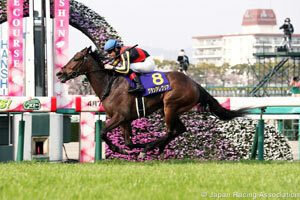 Hanshin Juvenile Fillies runner-up Chrono Genesis and third-place finisher Beach Samba came off first and second, respectively, in the Queen Cup (G3, 1,600m; Feb.9). The field also included Fairy Stakes (G3, 1,600m; Jan.12) winner Figlia Pura, Elfin Stakes (Listed, 1,600m; Feb.2) victor Aqua Mirabilis and Gran Alegria who was third against male opponents in the Asahi Hai Futurity Stakes (G1, 1,600m; Dec.16).